Before this gig I’d decided that I was too old, at 35, for a front row place. All that squashing and pushing and aching feet; it doesn’t appeal anymore. Time was I couldn’t do a show without being right in the middle of the heaving masses of super fans. I loved to get jostled and bashed about. But now, in the last couple of years, I’ve come to regard my place at shows as being a nice spot by the desk, or milling around stage left and right. I fancy hearing a show well, venue sound system permitting, and seeing it has become a nice bonus, rather than a crucial requirement. But, thanks to my gig companion’s devotion to Mr. White, I found myself at the venue as the doors opened, and I was presented with an opportunity I just couldn’t turn down. So, I rolled back the years and clung onto the barrier, front and centre, for dear life. What a brilliant decision it turned out to be. 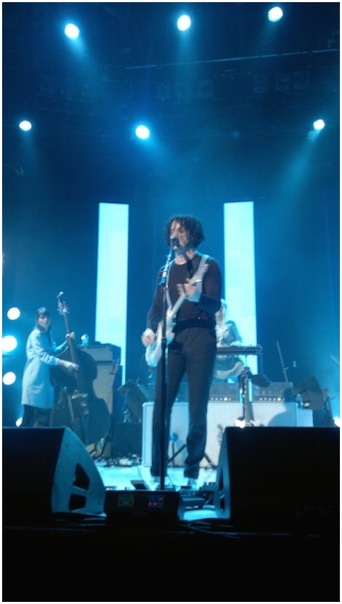 Jack White repackages the blues (and a bit of country, bluegrass and folk) in his own dirty, stripped down way, to an audience who probably knows little about its history or leading figures. This can only be a good thing. He’s an old fashioned sort; there’s no frills (or self-indulgence) to his music but, undoubtedly, stagecraft is his speciality. Watching him at such close quarters was a joy: he expressed himself with power and passion, he shredded to within an inch of his life and his excellent band, or bands, back him with the kind of belief and musicianship he’s never been surrounded by before. I say bands, because yes, there are two. First up were his all-male band, The Buzzards – keyboardist (and Mars Volta member) Ikey Owens, the brilliant Daru Jones on drums, bassist (often on double bass) Dominic Davis, violinist/pedal steel player Cory Younts and Fats Kaplin on second guitarist/fiddle/mandolin. His music has always been rather masculine and virile, and yet, the show only truly kicked off when his first band made their exit mid-song to be seamlessly replaced by his all-female rhythm section, The Peacocks. Punching even harder than their male counterparts, these women laid waste to the songs. Much has been said about his attitudes toward women but only a fool would deny that he is quite clearly musically smitten with each and every member of this band. 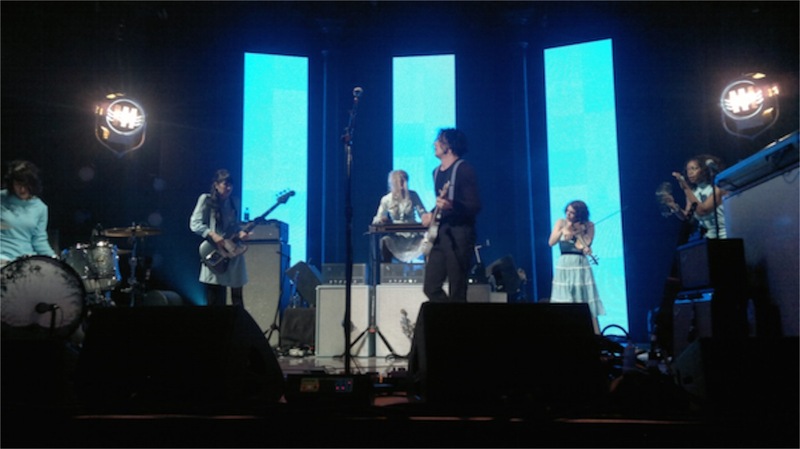 They all dazzled: the awesome Autolux drummer Carla Azar , pianist Brooke Waggoner , co-vocalist Ruby Amanfu , fiddler player Lillie Mae Rische , Margaret Bjorklund on pedal steel and bassist (formerly a Cardinal for Ryan Adams) Catherine Popper . I must say, I admire the very idea – financial good sense has gone out of the window when you take two full bands on the road. Then again, he has always seemed untouched by market forces – his label Third Man has released vinyl of auctioneers selling tobacco and a compilation that plays at 3rpm: you can only play it if you press your finger on the label. If he didn’t have a website you’d imagine he’d be found at some Nashville flea market, selling his wares like a carny at an old time medicine show. His appeal partly lies in being just so damn down to earth. After all, this is a man who married a girl from Oldham and then held a joint divorce party . Still, this was a free concert to promote iTunes, so no music was on sale. I guess running those two bands needs the odd concession. 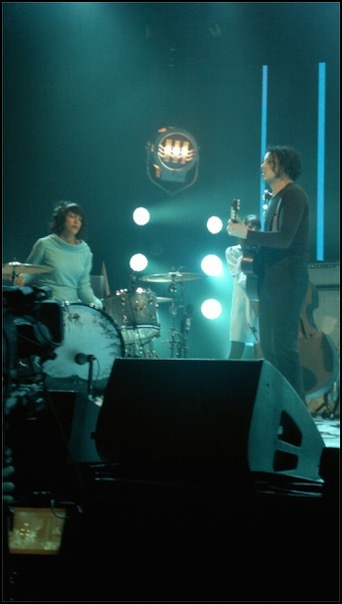 He ran through his own greatest hits – a dozen White Stripes songs, three from his Raconteurs period, a couple of Dead Weather tracks and half a dozen from his excellent solo album Blunderbuss. This whole show was just plain fun. The interplay was next level, and at times he seemed completely taken over, possessed, ferociously channelling this music, as the electric currents passed through him. What a privilege to watch this extraordinary performer, singer, songwriter and guitarist at such close quarters. These are just brilliant songs: Black Math, Hello Operator, Hotel Yorba, Dead Leaves and the Dirty Ground, Ball and Biscuit (with a nice snippet of Dylan’s Meet Me In The Morning at the start) and of course, to finish, the frankly iconic Seven Nation Army. I still have it in me, it turns out, to take on the pit at the front of a gig. But I couldn’t match this southern gentleman for energy, intensity and conviction. I walked out aching, and he’s doing it all again night after night. Of course, the old tropes were there – gently berating the audience for not making enough noise, having his manager (I assume, like his entire crew he was kitted out in a sharp suit so he could have been a roadie) good-naturedly exhort the crowd to leave their mobiles in their pockets and just enjoy the show and so on. It was old school but never felt contrived. It felt primal, distorted, thrilling and, paradoxically, completely current. I love a back of the venue saunter but, truly, you can’t beat looking the performer in the eye. I must do it again.